There is an API for other mods so that they can add their own wheel actions. RFTools and Immersive Craft do this for example. I can’t believe I never knew about this mod until now. This is beyond useful. McJty is a godsend. This mod is incredibly useful! I really like the search item function in particular. It's missing one thing however: the ability to search for an item from an inventory. Currently you have to be holding it to use this feature. Can you add a global keybind for the search item feature? Hey, I'm using MineMenu.. would the two mods conflict since they are similar in function? I haven't used minemenu myself but I think it is different as far as I understand. 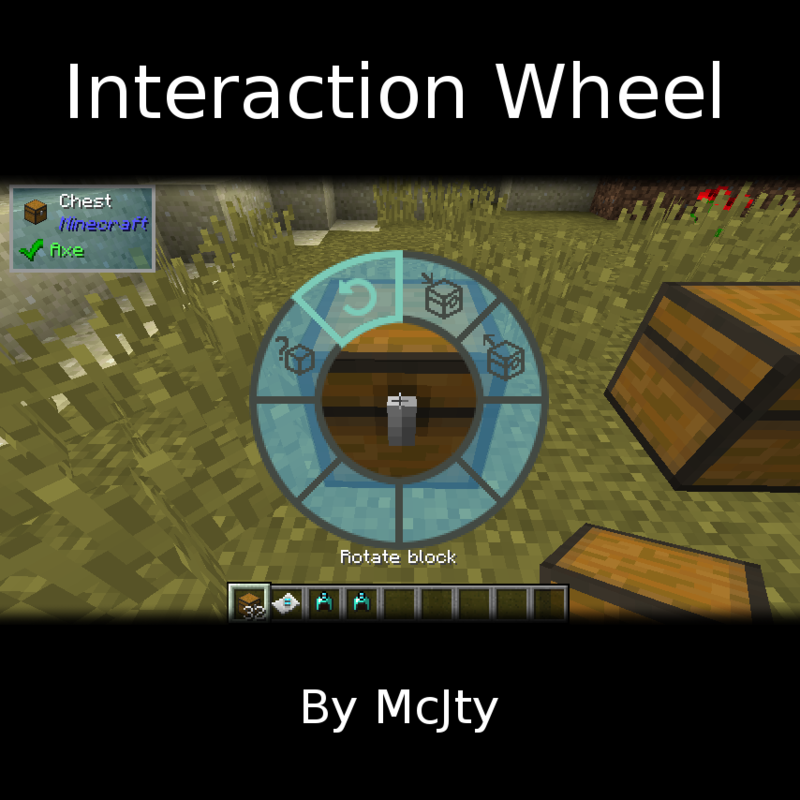 The functionalities that interaction wheel supports are different from the kind of functionalities minemenu supports. But why not try it out and see? a) I was not aware of that mod before I started this. b) It is not a rip off. Check out this mod a bit better. This mod is not a way to remove hotkeys (although it can help a bit with that). This mod gives quick access to context sensitive actions. i.e. the action to dump stuff in a chest is only available if you look at a chest. Same for other things. Saying a Mod is a rip off simply because it shares ideals with another mod is disrespectful. Keep that crap out of the community and enjoy the efforts put in. When I was using the Interaction Wheel, I opened the settings and thought I was turning on more options (clicked the buttons to "highlight" them), after selecting everything, I closed the window and now the interaction wheel no longer appears when I click the "X" key. I tried removing the config file to see if that would reset things, but no luck there. How do I get the wheel back so I can use it? After "selecting" everything and losing the wheel, I sort of figured I must have "deselected" everything. But the default wheel settings only showed 2 options and of the five visible options to select or deselect, the two matching the ones in the wheel looked "highlighted" to me, so I clicked the other three so all five looked the same. I have the spotlights on this mod and the rftools support as two separate videos as the timing of them was a bit different and I asked about rftools support after I uploaded the interaction wheel mod spotlight so that's why there is two. On the minecraft forum thread of this mod they should be there. They are not perfect, but they are as mod detail focused as possible. Sorry for no mic. I'm a small channel and trying my best with content as my excitement for mods as my priority at the moment. I like to focus on interesting ideas like interaction wheel or less known mods and less known mod authors. One because I enjoy those mods more nowadays and to help them out of the kindness I have for there ideas and creations. So I'll work out a mic at some point just not at the moment. If you don't like the videos for any reason that is fine. Just please give any feedback. But if it is about having no mic I understand it is annoying, I'm sorry. Cool! :) I'll see how it goes. You can pull it down if you don't need it later anytime if a bigger youtuber gets a hold of the mod and spotlights it for a bigger audience for example. If you want. I do like you have considered this so much. Thanks. It means a lot! :) If you want it to stay up I am glad. I'm so excited! This looks awesome can I spotlight this yet or do you want to do more with it before that is allowed. Or if anyone is allowed to yet in general. Any feedback is understandable. Thanks. I am thankful, besides you make great mods and have such amazing ideas. I thought this one needed to be known as soon as possible. I'm small in channel size and resources but I was excited and couldn't wait to show this mod. Thanks.